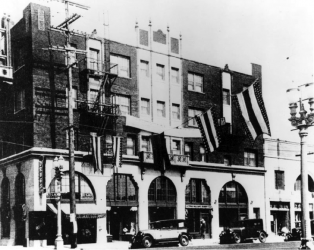 The Dunbar Hotel was not just any hotel, as suggested by the title of the Robey Theatre Company’s extended production “The Magnificent Dunbar Hotel” — it was a cultural hub where Black writers, singers and actors gathered in Los Angeles during the 1930s and 1940s. The play written by Levy Lee Simon and directed by Ben Guillory introduces the audience to this world of luxury on Central Avenue that harbored Black leaders and performers from the Jim Crow laws that prohibited them from staying elsewhere. “Informative and engaging, this underappreciated chapter of our local history is portrayed with panache and grace,” Philip Brandes said in his L.A. Times review. The play begins in 1931 with the renaming of the hotel by new owner Lucius Lomax (played by Dwain A. Perry). Lomax picks post-Civil War author Paul Laurence Dunbar as the namesake. Dunbar (Julio Hanson) serves as narrator for the play in the form of a ghost. Controversy surrounding the hotel begins when Lomax decides to open a nightclub inside against the wishes of the former owner. Soon prominent figures and well-known performers in the Black community populate the hotel, including W.E.B. DuBois (Tommy Hicks), Duke Ellington (Eddie Gomes), Lena Thorne (Tiffany Coty), and Ethel Waters (Elizabeth June). Hotel guests discuss topics ranging from Hollywood’s exclusionary hiring practices to the controversy about Black enlistment in World War II. These narratives of the rich and famous are intertwined with those of the hotel staff, who connect the storyline through the eras. “The play provides an entertaining and informative evening, bringing to life a rich history we could all stand to learn more about,” Mayank Keshaviah said in an L.A. Weekly review. Three new show times were added after the production’s success. Catch the show at 8 p.m. on Friday Dec. 26 and Saturday Dec. 27, as well as at 3 p.m. on Sunday Dec. 28. Call 866-411-8111 to purchase tickets. “The Magnificent Dunbar Hotel.” Los Angeles Theatre Center, Theatre 4, 514 S. Spring St., Los Angeles. www.thelatc.org. Like Intersections on Facebook, follow us on Twitter and sign up for the Newsletter to stay in the loop on news and views from South L.A. Email reporter Anna-Cat Brigida at [email protected] and follow her @AnnaCat_Brigida.